Meet Jorge Padron @ Havana �59 West End!!! Havana Connections is pleased to welcome Mr. Jorge Padron of his namesake Padron Cigars on Wednesday April 24th. We are hosting a Padron Takeover Party at Havana �59 Westend in his honor! The Takeover Party will have plenty of deals on the entire Padron portfolio and expert Cocktails and Appetizers courtesy of Havana 59! There are two different event tickets available for this event. $25 Regular Admission Ticket gets you 2 Padron Cigars (Thousand Series and 1964 Anniversary), a complimentary Mojito, a spread of assorted Appetizers and a chance to smoke with Jorge Padron. $65 VIP Pass gets you 3 Padron Cigars (Thousand Series, 1964 Anniversary and a 1926 Serie), a complimentary Bourbon Tasting, assorted Appetizers, and early access to meet with Jorge Padron (5:15pm). Tickets are available instore or online at EventBrite.com (additional fees apply). Follow the links below to Event Brite! 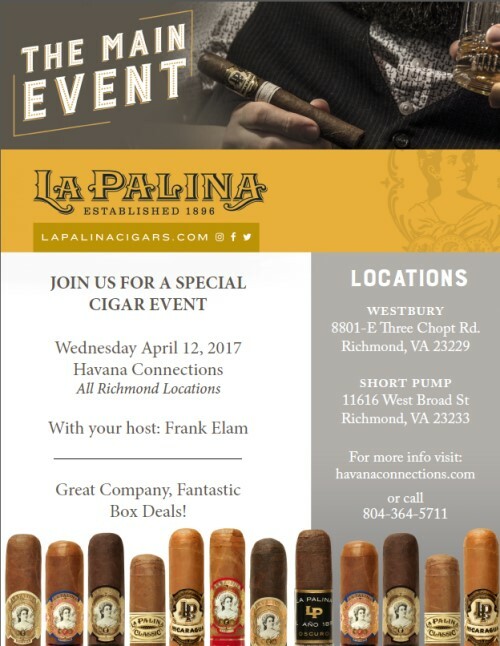 La Palina Event(s) @ Havana Connections Coming Up! We've got 2 days of La Palina Deals coming up! ALL DAY Wednesday April 12th @ All Richmond HC Locations! Bill Paley, whose family begun the CBS Network, resurrected the La Palina Cigar Brand which originally started production back in 1896. Today the cigars are made in the Dominican Republic, Honduras, Nicaragua and Miami, Florida USA! There is truly a blend for every palate! Area Sales Manager Frank the Tank Elam will be on hand offering La Palina deals of all sort. We will have the kickoff event at our Williamsburg store Tuesday April 11th at 5pm. We will extend the deals to all Richmond locations of Havana Connections on Wednesday April 12th. Please stop in and see what all of the hub-bub is about! 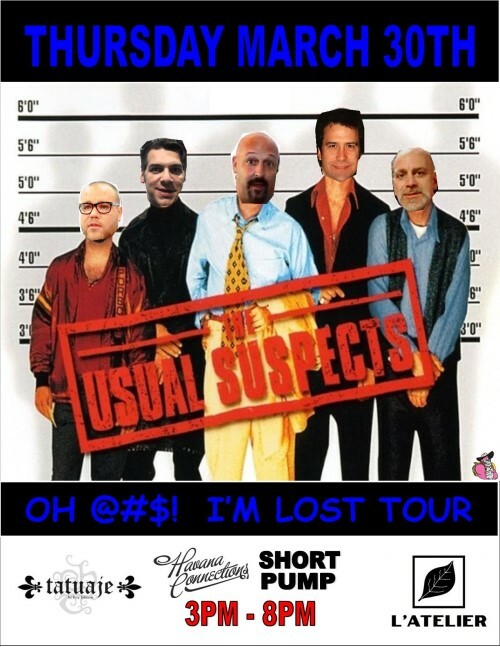 Tatuaje/L�Atelier "OH @#$% I�M LOST" Bus Tour Event The boys from Tatuaje and L�Atelier Cigars are on the road in their very own tour bus for an East Coast Tour! They are going to be parked at our Short Pump store from 3pm to 8pm on Thursday March 30th! Come out and meet the crew behind the cigars! Pete Johnson, KC Johnson, Dan Welsh, Sean "Casper" Johnson and our Chimpin-Crazy Sales Rep, Taven Johnson. That�s a lot of Johnsons!!! 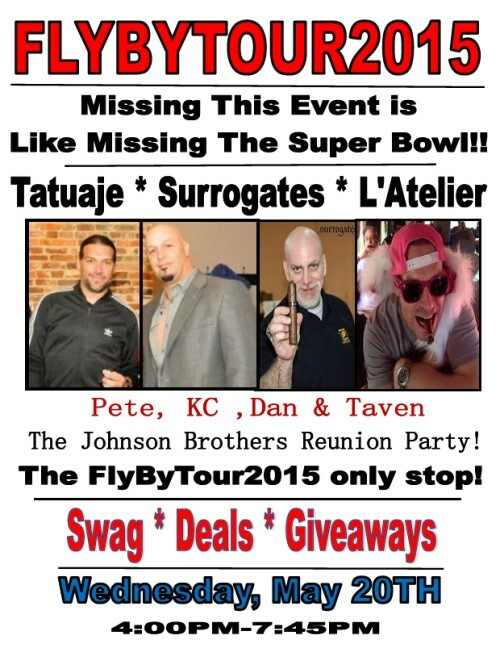 We will have event-only specials on Tatuaje and L�Atelier cigars while they are here. Additionally, we should have a very limited amount of special edition Tats, including the elusive Pork Tenderloin, Pork Chops and Le Vignobles! We can not hold any product or accept phone orders, so if you are interested in seeing what is available you have to attend! We hope to see you there! 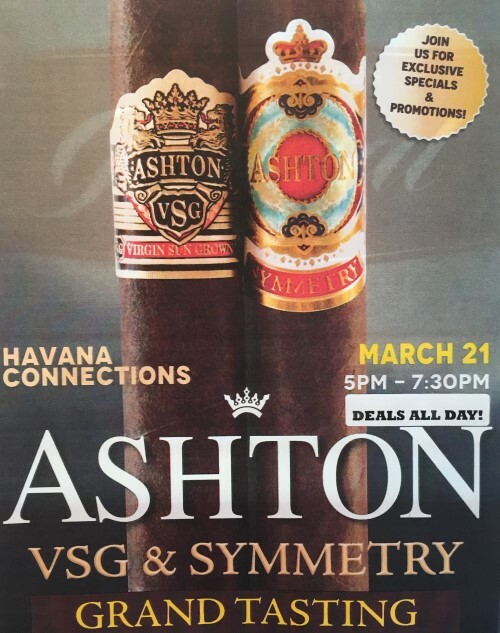 Ashton Symmetry & VSG Event We will be offering one day only specials on Ashton VSG and Ashton Symmetry this Tuesday March 21st at Havana Connections Short Pump! A deal on VSG? You heard us right! Sales Manager Alejandro Rubiera will be on hand from 5pm until 7:30pm to give you a head to head breakdown on the two blends, however we are going to have one-day only deals going all day. We hope to see you there! Tuesday March 21st 2017 - all day, but be sure to stop in after 5pm to meet Alec! We�ve got the Johnson Brothers ( Pete, KC and Taven) coming on May 20th!!! Wednesday May 20 th @ Havana Connections Swift Creek. This Event will kick off at 4 pm and go until everyone is happy. Tatuaje, L'atelier and Surrogates are some of the highest rated cigars year after year. With twelve plus blends and dozens of shapes this event will have a cigar just for you. We will have huge deals and great swag plus a limited amount of Event Only Cigars in a special blend. Event tickets are $10 each and get you a complimentary cigar to enjoy during the event. Hechicera Cigar Event @ Havana Connections Swift Creek! 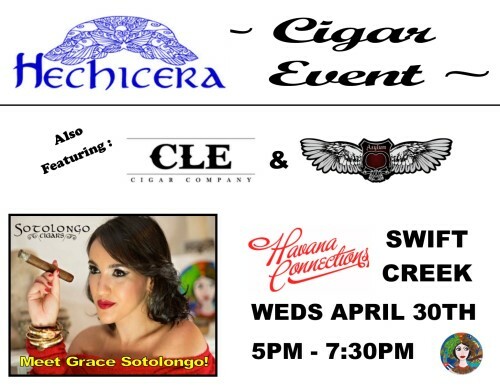 We�ve got Grace Sotolongo, the woman behind the Hechicera Cigar Brand coming to town for an event at the end of this month! Grace has blended a special cigar with Christian Eiroa of CLE Cigars. Made in Nicaragua, this cigar utilizes multiple tobaccos from Nicaragua�s finest tobacco regions. Medium bodied, balanced, with a hint of spice is the best way to explain this blend. Come on down an meet Grace at our Swift Creek store on the 30th of this month! We will have event only specials and deals, along with food & drink. In addition to the Hechicera brand, we will also have specials on all CLE and Asylum cigars as well. Event tickets are on sale now for $10 each and get you a complimentary Hechicera cigar, food & drink, and access to the best Hechicera/CLE/Asylum cigar deals of the year! Kuuts Cigars are new on the market and new to the shelves of Havana Connections! To kick off this new line we are hosting a duo of cigar events. Wednesday April 9th @ HC Short Pump and Thursday April 10th @ HC Williamsburg. Kuuts makes 3 diverse blends. Zapata - Miro - Placeres. Mild, Medium, and Full Flavored respectively. This new line of cigars are manufactured in Danli, Honduras and consist of well aged tobaccos. Andrew Lee, area sales representative will be on hand at these events to explain the history and tradition used to make these tasty blends. We will have event only deals and specials, so be sure to check out one of these events and try something new! Both events run from 5pm until 7:30pm. Event tickets are $10 each and get you a complimentary Kuuts cigar, food & drink, and access to event only deals! 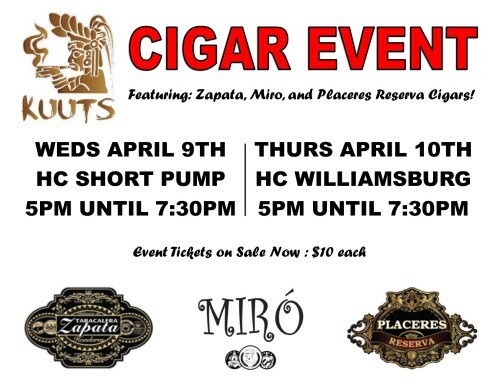 2 Cigar Events coming up at Havana Connections Short Pump and Swift Creek! 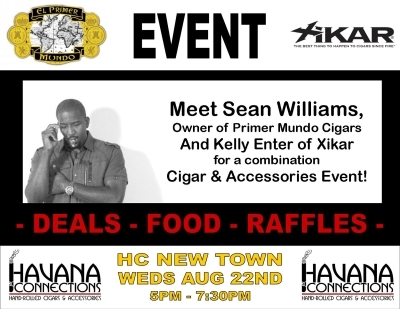 First up is a joint event with PDR & Primer Mundor Cigars and Xikar Cigar Accessories! Wednesday October 16th @ HC Short Pump from 5pm until 7:30pm we will have Sean Williams and Kelly Enter in the house. We will be have specials on Pinar del Rio and Primer Mundo Cigars along with deals on Xikar Lighters, Cutters, and Accessories! 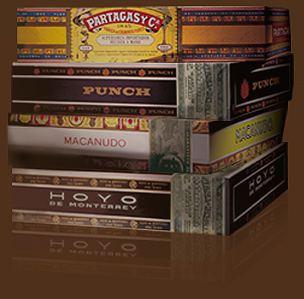 PDR cigars are produced in the Dominican Republic and come in an array of blends and wrappers suitable for any palate. Sean Williams is the brand owner of La Hermanada and Cosa Fuerte made by PDR. Next up is the premier of CAO Flatheads Cigars! Friday October 18th @ HC Swift Creek from 5pm until 7:30pm we will be hosting Ricky Rodriguez and Sharon Landry of CAO. The all-new CAO Flathead is a box pressed series of cigars being made in Nicaragua. These cigars are themed after the famed Flathead motors found in vintage hot rods! The Flatheads are a tasty medium to full flavored additiona to the CAO line of cigars. *Tickets for both events are $10 each and will get you a complimentary cigar, food/beverages, along with event only deals and raffles! Tickets are available at all HC locations. Plus don't forget we have the 2013 All Access Bonus Pass that gets you into every single HC Cigar Event thru the end of 2014! The AAP is available for $125! Jorge Padron in Richmond VA on Wed Oct 2! 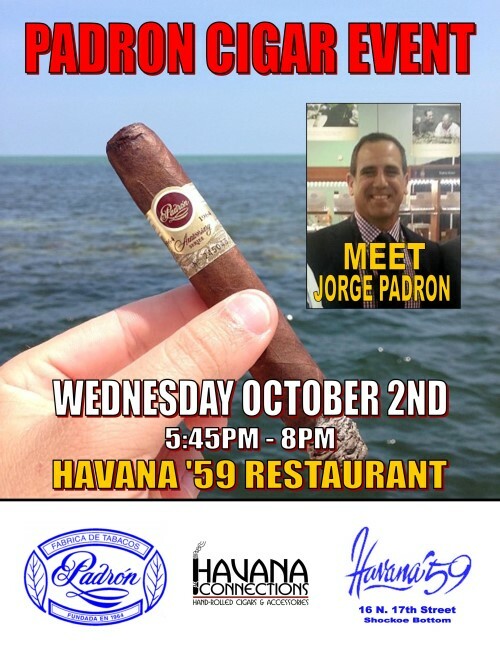 Don't miss Jorge Padron of Padron Cigars at Havana '59 Restaruant tomorrow night, Wednesday October 2nd from 5:45pm until 8pm. If you are not familiar with Padron Cigars, then you had better come to this event and be prepared to astound your palate. The Padron farms in Nicaragua produce 3 of the most highest rated brands in Cigar Aficionado Magazine cigar history! We will have deals on the Classic Series, 1964 Anniversary, Serie 1926, and the Family Series at this event. Best of all, you will get to smoke a Padron with the man himself, Jorge Padron. This event is being held on the 2nd floor of Havana '59 Cuban Restaraunt in Shockoe Bottom. Event tickets are $25 each, and will get you 2 cigars (Padron 3000 and a Padron 1964 Toro), hors' oeuvres, cash bar, and event only cigar deals! Tickets can be purchased in advance at any Havana Connections location, or at the door tomorrow night! 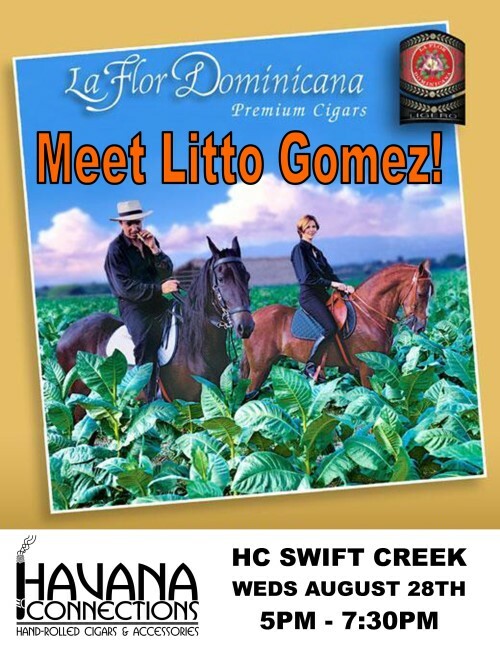 Meet Litto Gomez of La Flor Domincana at the ALL-NEW Havana Connections Swift Creek! That's right! Our Swift Creek store is moving! Just down the street on Hull Street. To kick off the move, we are hosting Mr. Litto Gomez, owner of La Flor Dominicana for our inaugaral cigar event at the new location. The La Flor Dominicana Experience with LFD Cigar Deals, Food, and Raffles. Plus you get a chance to meet the man behind the brand, Litto Gomez. The new location will be open at 10am Monday August 26th. The new shop is located on Hull Street, across from Harbor Pointe, situated near Glory Days Bar & Grill. Event tickets for the LFD Kick Off Event are $10 each and get you a complimentary LFD cigar, access to event only specials, and food & drink. Be sure to check out the new shop. We'll have a seperate smoking lounge located in the rear with leather seating and multiple flat screen TVs! We hope to see you there! Here is your opportunity to try the highly rated La Aroma de Cuba Mi Amor and the decadent Mi Amor Reserva! Ashton cigars has utilized the talents of Don Pepin Garcia to make these Nicaraguan beauties. Following up the success of the original La Aroma de Cuba, the Mi Amor and Reserva feature a dark cuban seed wrapper grown in Mexico and are blended to be rich and complex. Alec Rubiera, Ashton Sales Manager will be on hand offering some dynamite deals on the La Aroma de Cuba portfolio. Event Tickets are $10 each. 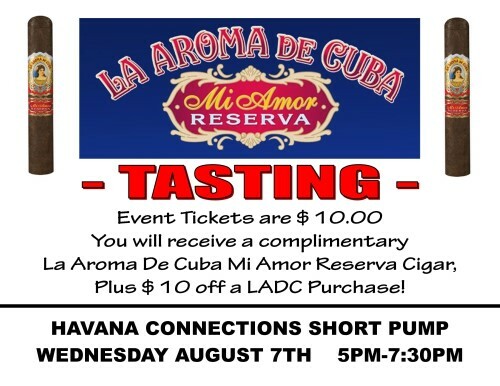 With each ticket you will recieve a complimentary Mi Amor Reserva cigar along with a $10 credit towards a La Aroma de Cuba purchase during the event! Get your tickets soon. 2013 Studio Tobac World Tour! The 2013 Studio Tobac World Tour! Studio Tobac is the creative arm of Oliva Cigars, and they are behind the Nub and Cain brands. There will be a Live Cigar Rolling Demonstration, deals on Nub, Cain, AND Padilla Cigars, along with refreshments and prizes! Tickets for this event are $10 each and available for purchase at all HC locations. Padilla Cigar Event @ Havana Connections! Have you tried the new Padilla Miamis or Padilla Reserves yet? Well here comes your chance! Wednesday April 10th, Havana Connections Short Pump will be hosting brand manager Susana Aragon of Padilla Cigars! Ernesto Padilla has a smattering of blends coming out of Nicaragua as well as Little Havana, Miami, Florida. The Reserves are manufactured by Oliva Cigars in Nicaragua and the Miami Series is coming from El Titan de Bronze in Miami. 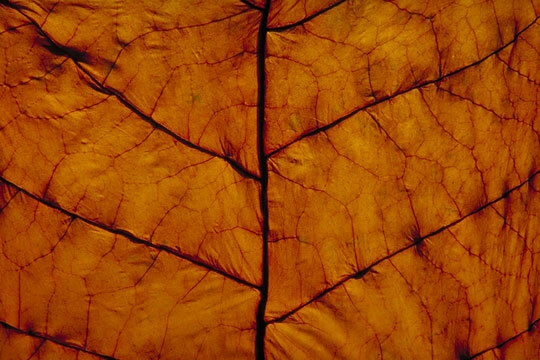 Tobaccos are mainly sourced from Nicaragua and combine to produce tasty medium to fullbodied cigars. Susana Aragon will be on hand at this event to answer questions about the Padilla portfolio. Event tickets are $10 each and will entitle you to a complimentary Padilla cigar, Event Only Specials, Food, and Fun. Wednesday 10/10/12 from 12pm until 7:30pm, Havana Connections Short Pump is going to be hosting Pete Johnson of Tatuaje/L'Atelier and Janny Garcia of My Father Cigars! We will be highlighting Pete's all new L'Atelier and Surrogates blends and Janny's new La Duena blend, all made at the My Father factory in Esteli, Nicaragua. *And speaking of Nicaragua, at the end of the event we are going to raffle off a trip for 2 to the My Father Cigar Factory in Nicaragua! That's right, you will get a chance to see where and how Tatuaje and My Father cigars are made. All airfare, lodging, meals, transportation, and of course cigars will be taken care of! This is an event not to miss. You will meet 2 Cigar Superstars, get the chance to try 2 all-new blends, and potentially get an all-expense paid trip to the factory! Event tickets are $20 each. Ticket holders will receive 2 complimentary cigars, food, drink, and access to all the deals, including meeting the brandmakers themselves! 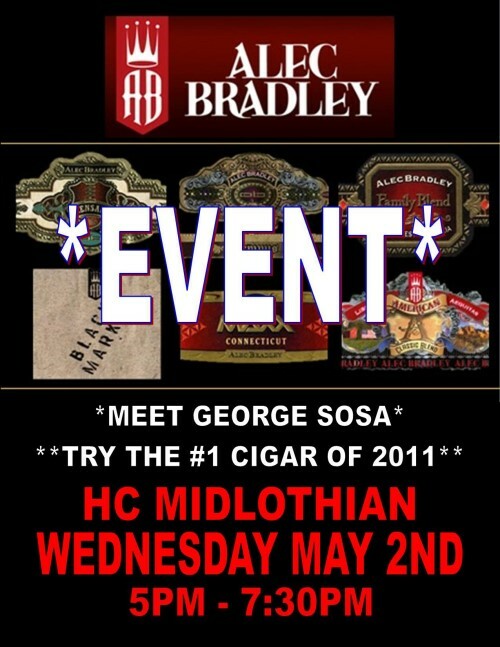 This Wednesday May 2nd, HC Midlothian will be hosting an Alec Bradley Cigar Event. 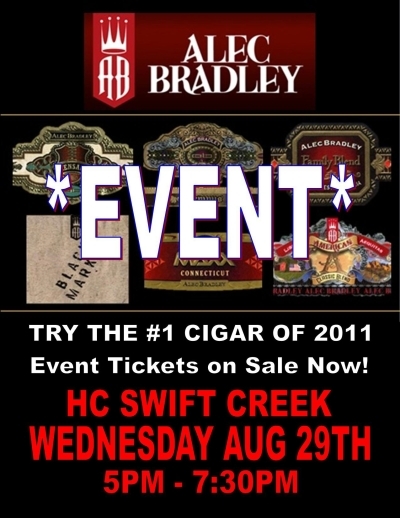 AB Vice President George Sosa will be in attendance offering all sorts of fantastic deals on all Alec Bradley cigars, including the #1 rated cigar of 2011, Alec Bradley Prensado! Event tickets are on sale now for $10. We hope to see you there! Meet Rocky Patel at Havana Connections! Event tickets are on sale now for $10each. Event attendees will recieve a complimentary RP cigar, have access to some spectacular Rocky Patel cigar specials, and have the opportunity to meet the man behind the brand! Our Rocky Patel events are always packed, so be sure to get your event ticket soon! Plus we are working on a dynamite Grand Prize to be given away at the event. You don't want to miss it. The 1888 has a mellow Connecticut Shade wrapper, the Libertad a spicy Sungrown wrapper. Smokers of all walks will find a suitable blend between these two. As always, we'll have food and refreshments, raffles, and some dynamite deals on some tasty cigars! Be sure to get you soon for this event at Westbury on Wednesday from 5pm until 7:30pm. 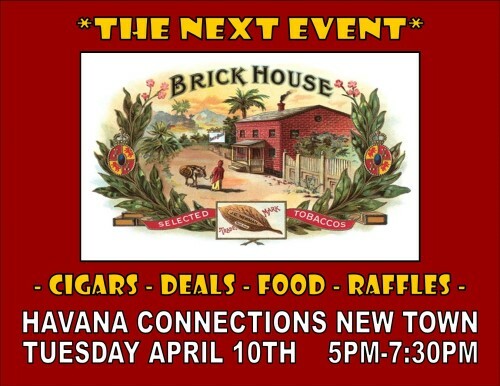 Tuesday April 10th we are hosting Brickhouse Cigars at Havana Connections New Town and Wednesday April 11th we are hosting Villiger 1888 + Libertad Cigars at Havana Connections Westbury. These cigars are made in Nicaragua, and feature a medium bodied blend of all sungrown tobaccos. These tasty cigars are also attractively priced from $4.75 - $5.95. Come give them a try! We'll have food, raffles, and all sorts of deals! The store is New Town in Williamsburg on Tuesday from 5pm until 7:30pm....event tickets are on sale now for $10 each and get you a complimentary cigar, food, and deals! 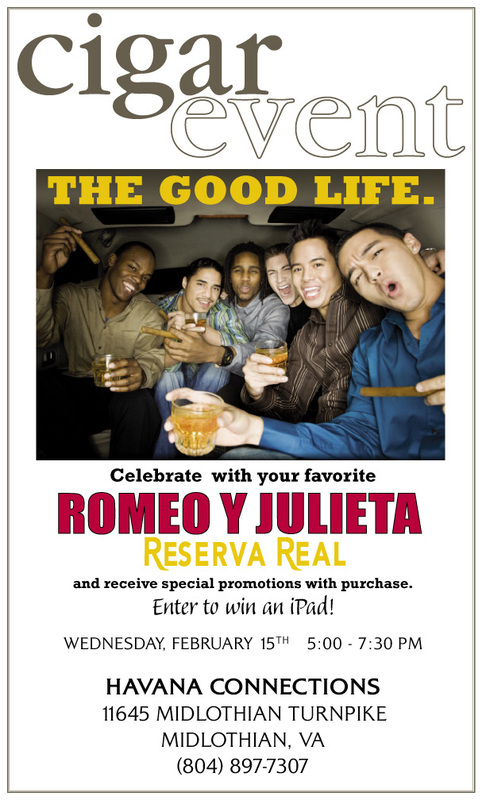 Coming up on Wednesday February 15th, Havana Connections Midlothian will be hosting a Romeo y Julieta Reserve Real Cigar Event! The event will be from 5pm until 7:30pm and will highlight one of best selling mild, smooth cigars: Romeo Real! If you haven't tried one already, the Reals (pronounced Ree-Al) is spectacular early in the day when you want a creamy smoking experience or anytime you want a leisurely smoking mellow smoke. We will have plenty of deals going on as well as a Single Malt Scotch tasting! Best of all, one of the door prizes will be a bottle of Scotch that we will be tasting! Event tickets are $10 each and are on sale now! All Access Pass Holders get in to this event for FREE! The AAPasses are on sale for $150 and get you in to every 2012 cigar event for FREE. They also qualify you for a FREE membership to the CRA and special raffles as well! On that note, congratulations to AAPass Holder Daryl Stuckey for winning our $1500 Montecristo wrist watch! We will have other AAP specific giveaways and deals at our events as well! We hope to see you at the Romeo Event! 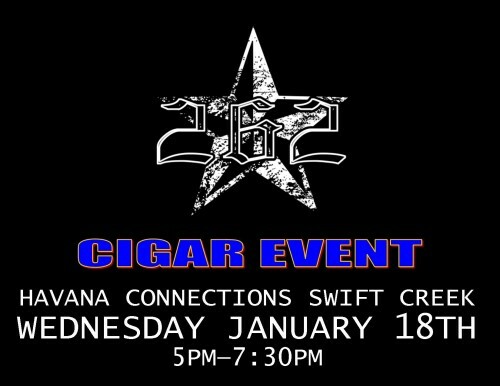 Big @$$ Cigar Event at Havana Connections Short Pump 2/1/12! That's right, it's called the Big @$$ Cigar Event! Deals on specials on 60ring Big @$$ cigars from CAO, La Gloria Cubana, Macanudo, Partagas, and Punch! We are going to be smoking big @$$ cigars, drinking big @$$ beers, and eating some big @$$ pizza! We will have deals on all of the 60 ring gauge CAOs, La Glorias, Macanudos, Partagas, and Punch cigars! The highlight of this big event is going to be the big @$$ grand prize. A jet black, big @$$ Invicta Watch! Event tickets are on sale now for $10 each. Remember All Access Pass holders get in for FREE! All Access Passes are $150 and get you into every cigar event for FREE, plus you will recieve extra special deals and exclusive raffles! Come smoke some Big @$$ Cigars with us at the Big @$$ Cigar Event! We hope to see you there! Smoke the Revolution! 262 brand owner Clint Aaron will be on hand to explain the philosophy behind the brand. 262 Paradigm and Ideology are made in Honduras and Nicaragua respectively. This botique brand make their blends in small quantity to ensure quality. Event tickets are on sale now for $10 each and entitle you to a complimentary event cigar, adult beverages, and access to some fantastic deals on 262 cigars! Remember, All Access Pass holders get in for free and will recieve even more exclusive deals! 2012 All Access Passes are available for $150 and will get you into every cigar event in 2012 for FREE! We hope you have a chance to smoke a 262 cigar and this you your prime opportunity. We hope to see you there! Oliva makes a huge range of cigars from mild to full. Serie G, O, the highly rated V, along with Cain and Nub! Cigars, Drinks, and Fantastic Deals. Event tickets on sale now for $10 each! 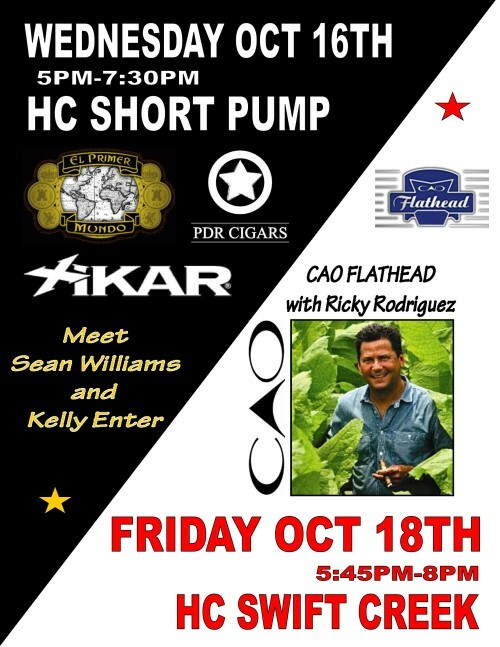 CAO OSA on Friday will host cigar blender Rick Rodriguez! The all new OSA blend from CAO is a fantastic combination of smoothness and body. Utilizing tobaccos from the San Agustin Valley, this blend can be appreciated by all palates. We have lots of deals, lots of prizes and lots of fun! Event tickets are $10 in advance or $15 at the door. 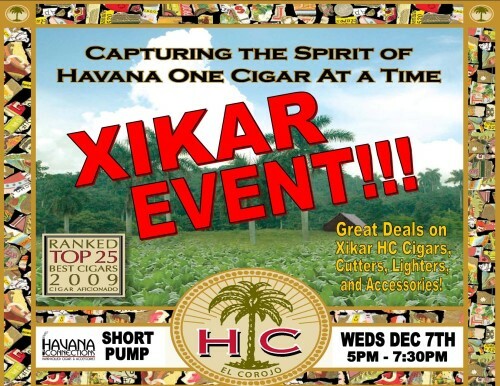 Xikar on Wednesday will be an opportune time to check some lucky people off your Holiday Shopping List! Event tickets are only $5 in advance or $10 at the door so get yours soon! We will have end of the year specials on everything Xikar including lighters, cutters, cigar cases, and the Xikar HC Series of Cigars! Come experience one of our best selling Nicaraguan brands! Perdomos are manufactured in Esteli, Nicaragua utlizing cuban seed Nicaraguan tobaccos and an array of diferent wrapper leaves. The Champagne Series with its Connecticut Shade wrapper continues to be one of our top selling Mild-Medium bodied blends. The spicy Gran Cru is better suited for the hearty cigar smoker. And then the all new Exhibicion Series is a blend anyone can smoke. Come give them a shot! 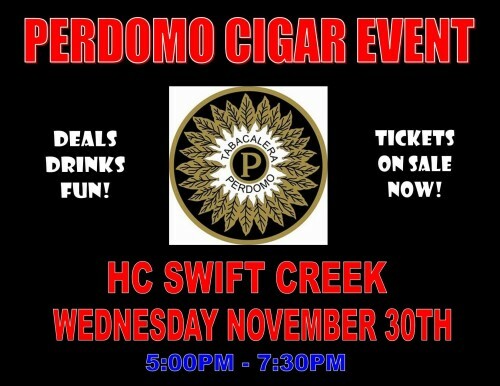 Walt Cukier, Perdomo Factory Rep, will be in attendance offering an array of fantastic specials, deals, and give aways! Tickets are $8 in advance or $10 at the door. Come try some of Nicaragua's Finest! 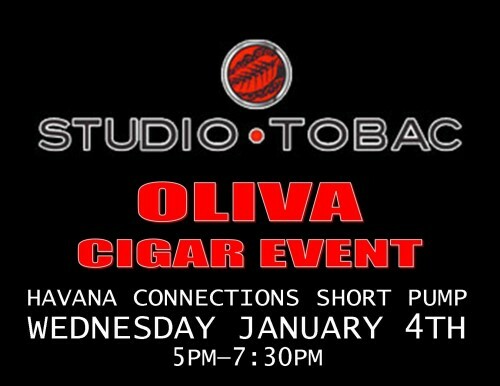 The Oliva Cigar Experience this Wednesday 11/16 at Havana Connections Midlothian from 5pm until 7:30pm! Meet Brad Arlington with Oliva Cigars. Brad can walk you thru all of the Oliva blends, including the G, O, V, Connecticut, as well as the Nub and Cain Series. We will have fantastic specials on everything Oliva! The Nicaraguan Factory produces a cigar for everyone's palate. Event Tickets are available at all stores for $8 in advance or $10 at the door once the event starts. Walt Cukier from Perdomo Cigars will be in the house on Wednesday July 27th at Havana Connections Swift Creek from 5pm until 7:30pm! Perdomos are one of our top selling Nicaraguan cigar brands, so now is you chance to explore all of their blends. We will be highlighting the Gran Cru and Champagne Series but will have deals on everything Perdomo! Event Tickets are $10 in advance or $20 at the door and will get you a complimentary Perdomo cigar, adult beverages and access to some fantastic one-day only specials! Xikar Cigar + Accessory Events Coming Up! Come meet our new Xikar Rep, Kelly, and check out the fantastic deals on Xikar HC Cigars and ALL Xikar Accessories, including Cutters, Lighters, Cases, and more! This is your opportunity to purchase that shiny new Xikar lighter you have been eyeing or a handy travel humidor to keep your precious stock in perfect smoking shape. We will have one night only deals on everything Xikar. Plus be sure to try the Xikar HC Series Cigars! Available with a number of different wrappers, they make a cigar blend for everyone! Mark your calendar for July 7th in Williamsburg and July 8th in Short Pump. We hope to see you there! Diamond Crown Cigar Event with Bobby Newman! 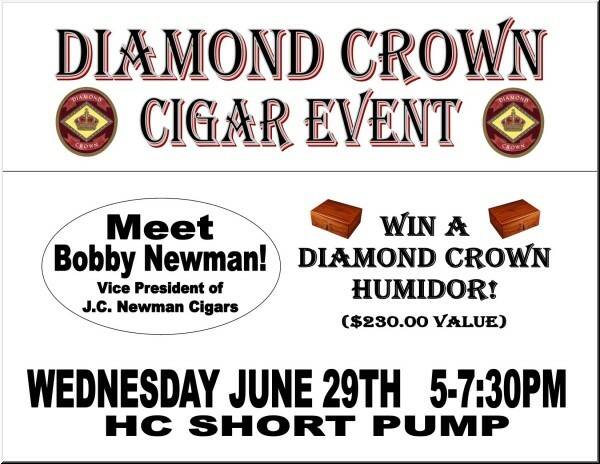 Wednesday June 29th we will be hosting the Diamond Crown Cigar Experience with Bobby Newman at Havana Connections Short Pump! You do not want to miss this event.....we are going to raffle off a $230 Diamond Crown Humidor! Diamond Crown cigars are made by Arturo Fuente and feature silky smooth Connecticut Shade wrappers, dark and succulent Connecticut Broadleaf Maduro wrappers, or spicy sungrown wrappers on the Diamond Crown Maximus. We will have specials on all of the Diamond Crowns including the ultra exclusive Diamond Crown Julius Caeser! Julius Caeser Newman started JC Newman Cigars back in 1895. We are proud to be hosting this event with JC's Grandson Bobby Newman in attendance! Tickets are on sale now for $10 in advance or $20 the day of, so get your ticket soon. The event is Wednesday June 29th at Havana Connections Short Pump from 5-8pm! WHY: Smoke some ultra exclusive cigars, and get a chance to win a Diamond Crown Humidor! Just in! Meet Matt Booth of Room 101 Cigars!!! We are going to have a blowout Room 101 Event at Havana Connections Swift Creek on Wednesday June 22nd! Deals, Fun, the usual........but of special note is that we are going to give away a one-of-a-kind Room 101 Cigar Cutter at this event! 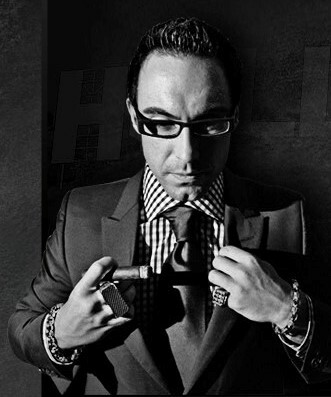 In addition to having a custom cigar, Matt Booth of Room 101 is a custom siver jewelery designer. He has made a prototype silver cigar cutter that he has graciously offered up for raffle! Event Tickets are $10 in advance / $20 the day of the event, so get yours soon! *featuring the Room 101 Cutter Giveaway! Tickets are available at all stores! More details to follow! 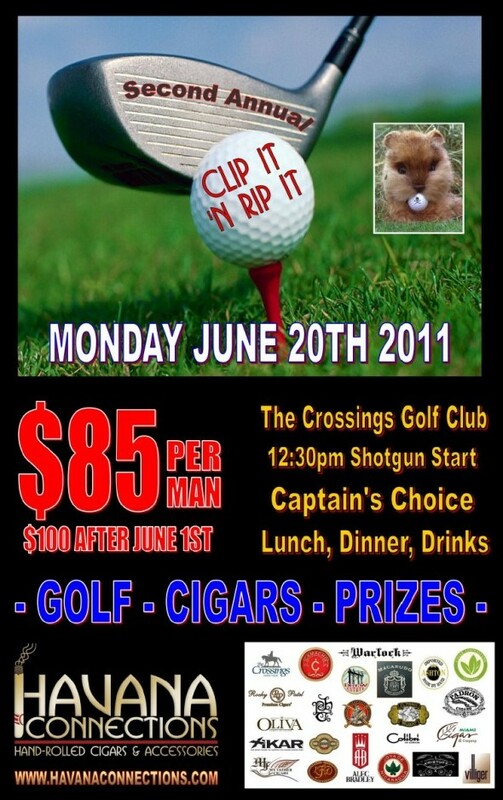 Havana Connection's Second Annual CLIP IT 'N RIP IT Golf Tournament is coming up! The format is Captain's Choice with a Shotgun Start at 12:30pm. Get there early and hit the driving range and enjoy your complimentary lunch. Gobs of cigars and swag will be provided. We will have an awards ceremony and dinner following the event! Last year's tournament was an overwhelming success. We expect this year to sell out quickly so reserve your foursome now. The cost per player is $85 or $340 per foursome thru May 31st. Starting June 1st, the cost is $100 per player or $400 per foursome, so be sure to sign up soon! Individual golfers will be coupled with a foursome the day of the tournament. This is THE Cigar+Golf Tournament of the year and you do not want to miss it! Stop in to any Havana Connections Location and fill out your entry form! If you are unable to pick up an entry form in store, you may apply over the phone by calling toll free 1-866-561-0344. When was the last time you got a FREE Lunch? Well Wednesday June 15th is your day. Not only will we buy your lunch, we'l buy you dinner too! That's right. 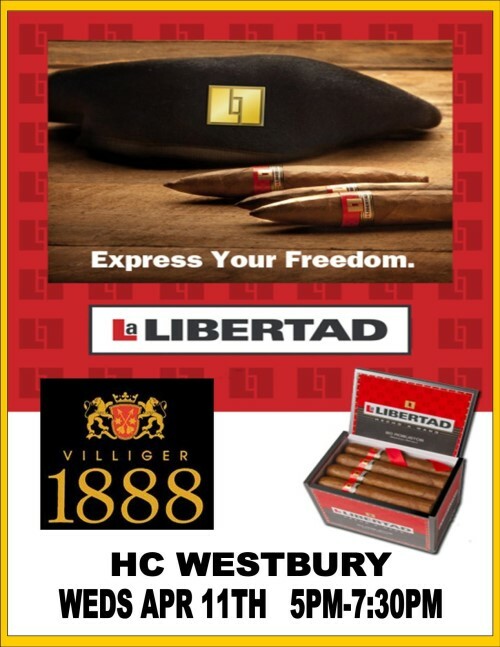 Villiger / Libertad Cigars is sponsoring a free meal at 2 of our stores this upcoming week And of course in addition to the grub, we will have some fantastic deals on Villiger 1888 and Libertad cigars. These events are free so you have no excuse not to stop by, light up and chow down! Studio Tobac World Tour - Havana Connections Saturday May 28th! 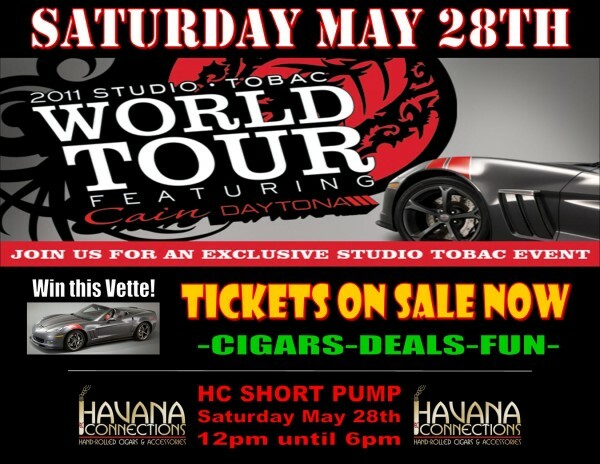 Come see the Studio Tobac Corvette at Havana Connections Short Pump on Saturday May 28th from 12-6pm! We will have fantastic deals on Nub and Cain cigars, including the all-new Cain Daytona! Studio Tobac is the think-tank for Oliva Cigars. They come up with new and exciting blends and cigar styles utilizing Oliva Cigars vast supply of tobaccos. They have have commissioned a limited edition Studio Tobac Corvette to be taken to a limited number of store events. Havana Connections is proud to be part of the Studio Tobac World Tour. The best part! You will get the opportunity to win the Studio Tobac Corvette! Just come to the event Saturday May 28th! Also, Studio Tobac has also put together a limited edition sampler of cigars, only available at the event. This sampler contains completely unreleased cigars! Tickets for this event are only $10 each and are available at all Havana Connections locations! We will have factory representative Walt Cukier of Perdomo Cigars at Havana Connections Williamsburg, Thursday April 28th from 5pm until 7:30pm! This Perdomo Cigar Event will highlight some of Nicaragua's finest cigars! Perdomo Gran Cru, Habano, Lot 23, and the best selling Perdomo Champagne. Tickets are on sale now for only $10 each. The ticket price will allow you entry to the event, a complimentary Perdomo cigar, beverages, and access to some of the best deals on Perdomo Cigars we have ever offered! We hope to see you there. Be sure to get your ticket soon! WHAT: The Perdomo Cigar Experience! Contact Havana Connections Williamsburg (NewTown) for tickets or questions: 757-229-4060. 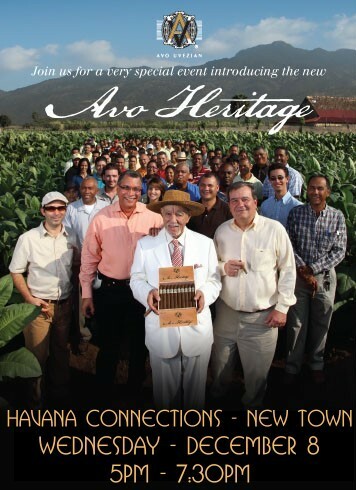 Avo Heritage Event this Wednesday at Havana Connections New Town! This Wednesday December 8th from 5pm until 7:30pm we will be holding the Avo Heritage Experience at Havana Connections New Town! Avo Heritage is an all-new blend from the Davidoff Factory. A special Sungrown Wrapper gives this cigar its richness and complexity. Avo and Master Blender Henke Kelner have hit a home run with this blend which is the fullest Avo to date. Tickets for the event are $10 in advance and $20 at the door the day of the event. Tickets holders will receive a complimentary Avo Heritage Cigar, food, drink, and access to all of the fantastic deals! Davidoff Area Sales Manager Andrea Pingel will be on hand to answer questions about Avo and his wonderfull cigars! This should be a fun event, focusing on a tasty smoke. We hope to see there, this will be our last official event of 2010! Come join the excitement! Don't miss the Havana Connections Tailgate Party! This Sunday December 5th the Washington Redskins are playing the New York Giants! 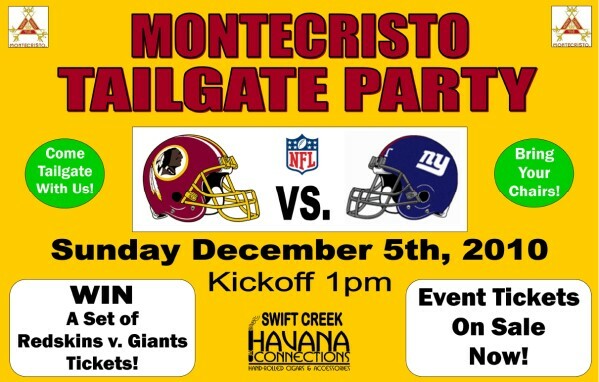 You don't want to miss our Montecristo Tailgate Party at Havana Connections Swift Creek. We will have our new Flat Screen TVs broadcasting the game, Burgers and Dogs on the Grill, and plenty of deals on Montecristo cigars and other blends from Altadis USA. Best of all, 1 lucky attendee is going to win a set of tickets to the January 3rd Redskins v. Giants match up on January 2nd! We are giving away Club-Level Seats and a Premium Parking Pass! You must attend this event to get your chance to win. We still have event tickets available at all Havana Connectios Locations for $10 in advance or $20 at the door the day of the event. Admission gets you a complimentary cigar, food and drink, and access to all of the fantastic game-day deals! Come tailgate with us! Kickoff is at 1pm, so come hungry, bring some chairs, and be ready for some fun! We hope to see you there! Also, keep an ear out for details of our upcoming Avo Heritage Event at Havana Connections New Town on Wednesday December 8th.......more details to follow. These are going to be some great events! Tickets are on sale now for $10 in advance or $20 at the door. 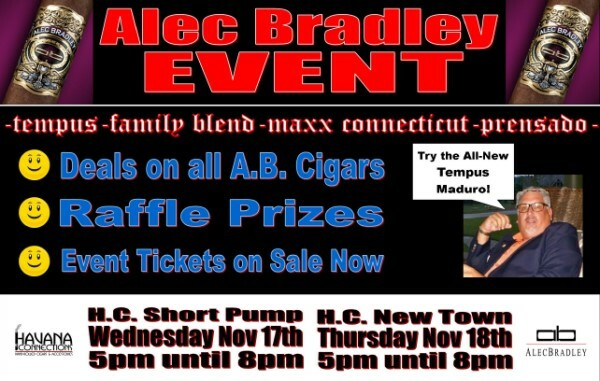 This event will introduce the all-new Tempus Maduro! The classic Tempus has garnered great ratings in Cigar Aficionado Magazine......well now it's time to experience the Maduro version. Along with that we will have great deals on Prensado, Maxx CT, and the Family Blend that also just received a 94 rating in CA's Cigar Insider. Along with these great cigars we will have some fantastic deals, food, and an extra special Aged Rum tasting that will pair beautifully with the cigars! *Tickets available for $10 in advance. Each ticket will get you a complimentary cigar, food, drinks (including a Rum tasting) and access to all of the great deals! 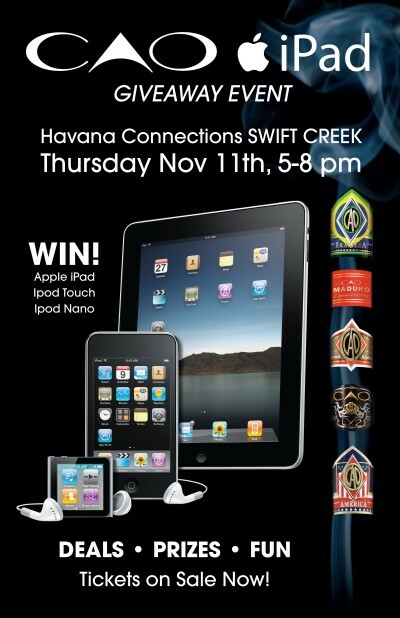 Between now and November 10th, when you buy CAO Cigars you will get a chance to win an Apple iPad, an iPod Touch, or and iPod Nano. For every 3 CAO Cigars you buy you will receive 1 entry to win! We will give away these prizes at the CAO iPad Giveaway Event this Thursday November 11th at Havana Connections Swift Creek from 5-8pm. You do not need to be present to win, but you should definitely check out this event! Event tickets are $10 in advance or $20 at the door. Each event attendee will receive a complimentary CAO cigar, beverages, and some outrageous deals on CAO! Event attendees will also get a chance to get many more chances to win the Apple Gear! Buy as many CAO cigars as you wish before the event to get your chances to win. But, buy CAO at this Event, and you will exponentially grow your chances to win, with additional entries and discounts! The Apple iPad has taken the electronics world by storm and is the most sought after gadget in America right now. Here is your chance to win one. Don't miss out! Event Tickets are $10 in advance or $20 at the door. Get your raffle tickets now whenever you buy 3 CAO Cigars at any Havana Connections Location! Rocky Patel Event This Week! Featuring Nish Patel and the 42" TV Giveaway! Ever hear of Rocky Patel cigars? We know you have. Come meet Rocky's brother Nish at Havana Connections Midlothian on Thursday November 4th from 5-8pm. Tickets for the event are $10 in advance and $20 the day of. Best of all, one lucky person at the event is going to win a flat-screen 42" LCD HDTV! Your ticket price will get you a complimentary Rocky Patel Cigar, Drinks, a chance to meet Nish, as well as access to all of the fantastic deals on Rocky Patel cigars. Each time you indulge in the Rocky Patel cigar specials you will receive raffle tickets for the TV. That's right....one lucky customer will win the 42" TV at the end of the event. That TV may be yours! Event tickets may be purchased at all Havana Connection locations. 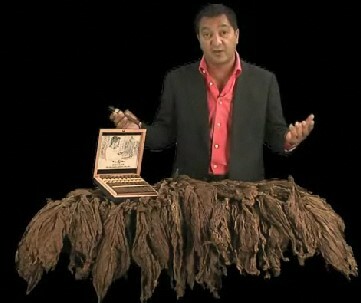 WHY: Meet Nish, smoke some RP cigars, WIN the TV! 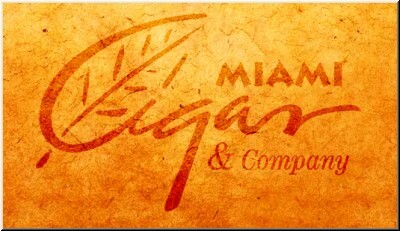 We will be featuring a new cigar from Miami Cigars: Guillermo Leon. 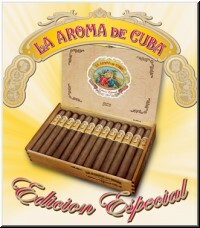 Additionally there will be specials on all La Aurora and Nestor Miranda! 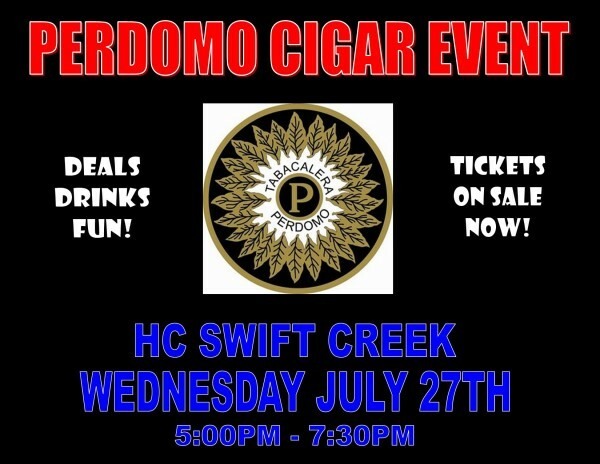 The Perdomo Experience is coming to Havana Connections Swift Creek. Thursday October 28th from 4pm until 8pm, Perdomo Factory Rep Walt Cukier will be on hand offering specials and deals on some of Nicaragua's Finest, Perdomo Cigars! This is a FREE event, so be sure to stop by and see what the hub-bub is all about. Perdomo makes the blockbuster Champagne series which has been one of our best-selling mild cigar for years. Also on special will be the Gran Cru Series as well as Perdomo Habano. Perdomo makes a cigar for everyone's palate! Be sure not to miss the festivities! 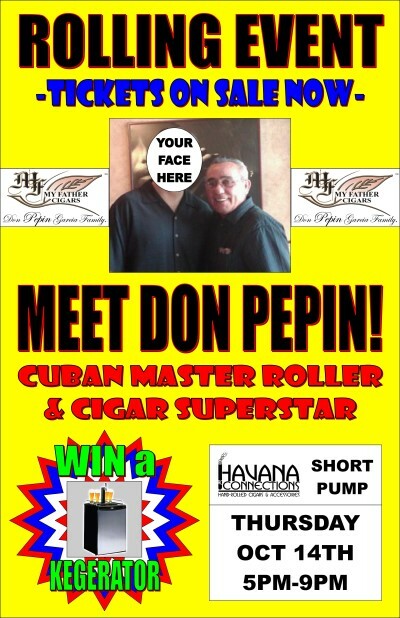 Don "Pepin" Garcia is coming to Havana Connections Short Pump on Thursday October 14th! We will be hosting an extra special Rolling Event with Pepin from 5pm until 8pm highlighting his My Father brand of cigars. That's right...smoke a freshly rolled cigar with the creator himself! One of his prized Grade 7 Rollers will be on hand rolling cigars in front of your eyes! We will showcase the My Father Brand along with some of Pepin's other lines as well! The more you buy, the more fresh rolled cigars you'll get! Plus we will have some killer door prizes! Yep...someone at the event is going to take home a self contained Kegerator(valued at over $500)! What could be better? 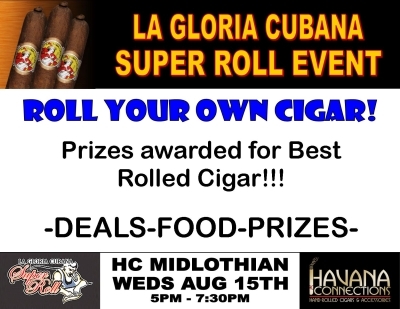 A fantastic cigar party featuring Cigar Superstar Don "Pepin" Garcia, Live Cigar Rolling, Cigar Deals, Fantastic Prizes, and a Whole Lotta Fun! Tickets are on sale now for $20 in advance and $25 the day of the event. Get your ticket soon, this will be a blockbuster event! WHY:	Meet the man himself, smoke a fresh rolled cigar, Win a Kegerator! 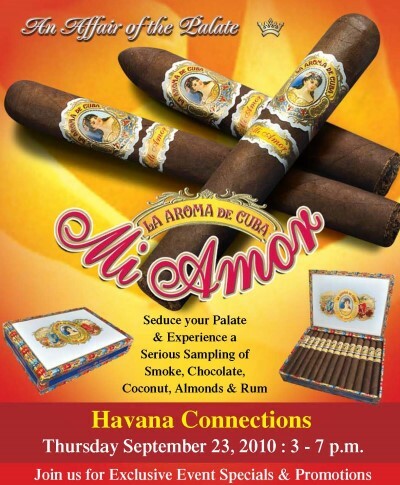 This Thursday, September 23rd at Havana Connections WESTBURY from 3-7pm is a tasting event featuring the all-new La Aroma de Cuba Mi Amor by Pepin Garcia/Ashton Cigars. Tickets are on sale now for $10. This is the fullest-bodied blend of the La Aroma de Cuba Trilogy featuring a box-pressed cigar with a special priming Cuban Seed Mexican Maduro Wrapper. The $10 ticket will get you a cigar, a full tasting seminar hosted by Evan Carpenter of Ashton Cigars, beverages, and of course some fantastic deals. Plus, best of all, you can redeem your ticket for a $10 discount towards a La Aroma Mi Amor purchase this night, making this a FREE Event! Call our Westbury store for more details at 804-673-6523. This Friday and Saturday we will be hosting David Sather from Drew Estates Cigars. Drew Estates is best known for its Acid blend of aromatic cigars. However, they have recently released the ultra-exclusive Liga Privada series which is a a traditonal full-bodied cigar has blown away the cigar world. This cigar is best enjoyed by aficionados that value richness, complexity, and body. Our Drew Estates Events will have specials on both the highly popular Acids, Naturals, and the traditional Liga Privada series. 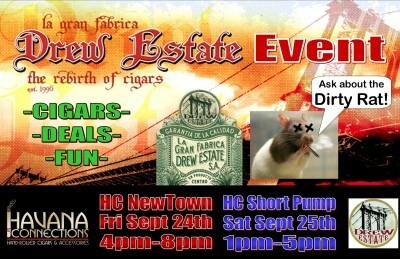 Havana Connections NewTown will host the event on Friday September 24th from 4pm until 8pm. Havana Connections Short Pump will host the event on Saturday September 25th from 1pm until 5pm. These are FREE Events so everyone should stop by and check out the deals. Acid Cigars have been a blockbuster seller for us so now is the time to stock up, and for you traditional guys, be sure to stop in and try the blockbuster Liga Privada series. *and for you Liga maniacs......word on the street is we will have a small allotment of the all new Dirty Rat! You must come in to try it! 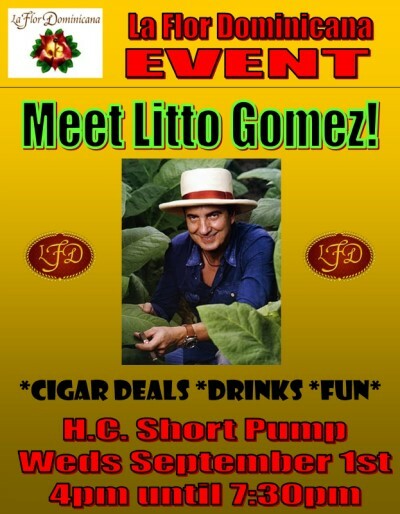 Meet Litto Gomez at Havana Connections Short Pump! Litto Gomez, owner of La Flor Dominicana will be at Havana Connection Short Pump on Wednesday September 1st from 4pm until 7:30pm. This will be the first time that Litto has visited Richmond, Virginia! This will be a FREE event, so be sure to come by and meet the man himself and induldge in some of the fantastic deals we will have on all La Flor Dominicana Cigars! La Flor Dominicana Cigars are best known for the Double Ligero Chisel which Litto developed after smoking a Torpedo cigar that wound up with a Chisel tip after clenching it in his jaw while rummaging through one of his aging rooms. He has since developed a number of new blends including the Air Bender series and the Mysterio Perfecto! 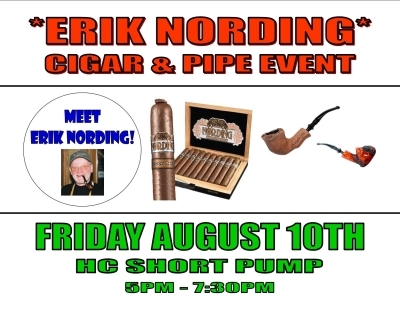 Don't miss this chance to meet a Cigar Superstar at Havana Connections Short Pump on Wednesday September 1st! We hope to see you there! 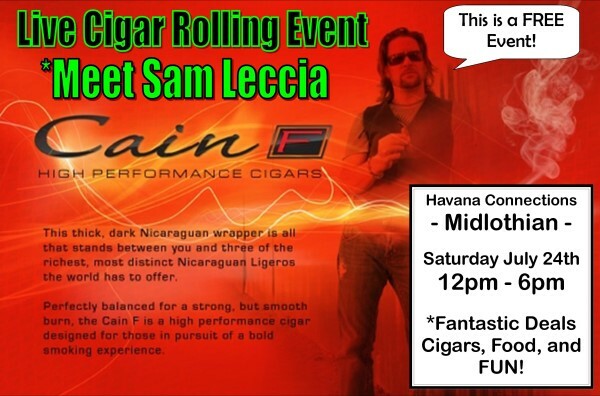 Sam Leccia of Nub Cigar / Cain Cigar Fame is bringing his Cain F Tour to Havana Connections - Midlothian on Saturday July 24th! This will be a FREE Event taking place from 12pm until 6pm. 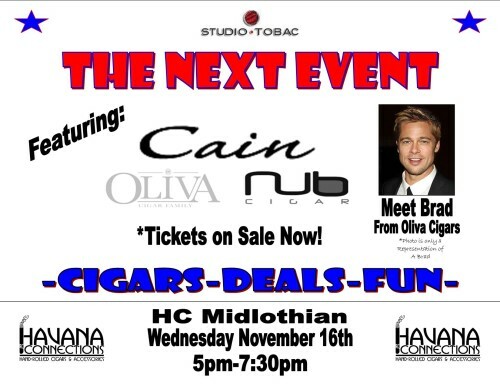 Come by and meet Sam who owns the Cain/Nub Cigar brands made by Oliva Cigars. Sammy brainstormed the Nub concept a few years ago and will be rolling some cutting edge Artisan-Nubs while you watch! Plus the all new Cain F Nub will make its Virginia premier! We'll have Food & Drink and some Rockin' Cigar Deals! 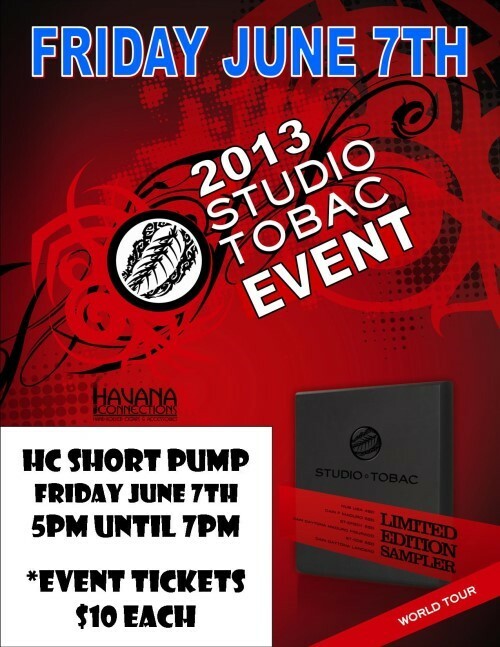 This is a FREE Event, but be sure to stop by any Havana Connections location and get a complimentary Event Ticket that will be good for $10 off a Cain/Nub purchase when you redeem the ticket at the event! Havana Connections - Williamsburg. 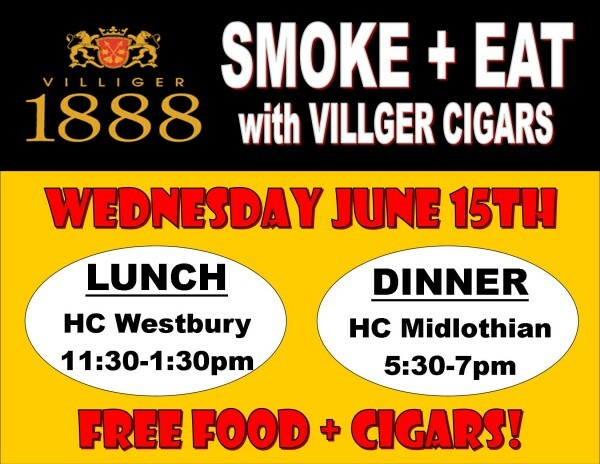 Thursday July 15th from 4pm until 7pm, Havana Connections New Town in Williamsburg will be hosting a Villiger 1888 Event. This Dominican made cigar has been 120 years in the making. Villiger, known for their European cigars has finally entered the premium hand rolled market here in the US. Mild, toasty, and balanced is how we would describe this smooth looking Connecticut Shade cigar. Villiger Sales Manager Lois will be on hand offered specials and door prizes! Havana Connections - Short Pump is going San Cristobal Crazy on Thursday July 15th! From 5:00pm until 7:30pm we will be tasting the San Cristobal Papagayo XXL and the San Cristobal Del Sol blends made by Don "Pepin" Garcia in Nicaragua. Tickets will be available soon for $10 in advance or $20 the day of the event. Each ticket holder will receive one of each of these cigars, beverages, and the opportunity to take advantage of some great deals! We are going to have some amazing prizes as well that will be announced soon! Best of all, each ticketholder at the event can redeem their ticket for $10 off a San Cristobal purchase during the event, making this a FREE event! La Aroma de Cuba Cigar Event at Havana Connections Swift Creek! Get a chance to Win $10,000 in Cash!! That's right, attend our 2010 La Aroma de Cuba Cigar Event and you can qualify to get a chance to win Ten Grand on the spot! Tuesday May 18th from 5pm - 8pm we are doing a dynamite La Aroma de Cuba Tasting including the La Aroma de Cuba Classic Blend and the La Aroma de Cuba Edicion Especial, both made by Don Pepin Garcia. Tickets are on sale now for only $15. We will be tasting a Single Malt Scotch and a Small Batch Bourbon with the two cigars as well. On top of that we will have some fantastic deals! Most importantly you can qualify to win an opportunity to roll the "Ashton Dice" for a chance to win the $10,000. We have never had a prize like this! You can win $10,000 on the spot! Best of all, each ticket-holder will be able to redeem their ticket for a $15 discount towards the purchase of any La Aroma de Cuba cigars this night only, therefore this makes it a Free Event! We hope to see you there! Come on down and try your luck at winning the Cash! WHAT: The La Aroma de Cuba Extravaganza with a chance to win $10,000! WHY: La Aroma de Cuba Cigar Pairing with a Single Malt Scotch, Small Batch Bourbon, and a chance to win the cash! Tickets are on sale now for $15 each at all Havana Connections locations! Have you tried the newest creation from the Camacho Factory? To celebrate, we are rolling out the red carpet for an Event, featuring the mastermind behind the Room 101 brand, Matt Booth. Matt, a Los Angeles designer, has teamed up with Christian Eiroa of Camacho Cigars to produce a one of a kind cigar. An exclusive Semilla 101 wrapper has been used for the first time to produce an oppulent blend, focusing on balance, but with that subtle Camacho spice. Check them out at www.room101cigars.com. The event will kick off at our Short Pump Store at 5pm on Tuesday December 8th. Tickets are on sale now. As always, ticket holders will recieve a complimentary Room 101 cigar, frosty beverages, a chance to win some cool doorprizes, and some awesome deals! If you haven't tried the Room 101 yet, now is your shot! If you have never attended one of our Cigar Tastings courtesy of Ashton Distributers, then you don't know what you are missing. These events are fantastic because they actually break-down all the flavors and sensations that you taste when you enjoy one of the highlighted cigars. Yes, we all enjoy cigars and the camraderie of smoking together with friends, but sometimes we take take for granted all the subtleties that we taste! 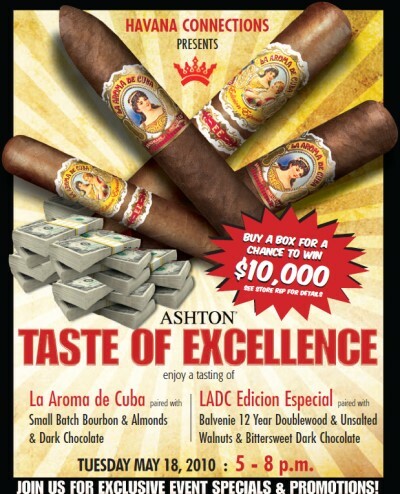 Evan from Ashton Distributers is in town this Thursday November 12th for the Taste of Excellence Tour, highlighting La Aroma de Cuba Edicion Especial Cigars made by Don Pepin Garcia. Tickets for the event are $10. Ticket holders will be treated to a complimentary cigar as well as a special pairing seminar in addition to event specials and deals! As you smoke the La Aroma de Cuba EE, Evan will take your palate on a journey. First you will try a few unsalted Walnuts that will cleanse your palate. Next you will take a bit of Dark Chocolate and then a puff on the cigar which will reveal the sweet, earthy flavors of the binder and filler. Next you will take a sip of Patron Anejo Tequilla followed by another puff of the cigar which will focuse your tastes on the spicy wrapper, courtesy of Cuban Seed Ecuadorian Tobacco. This process will focus your tastebuds in the future allowing you to distinguish more of the nuances that premium cigars can provide. Throughout the evening ticket holders will be able to enjoy event only specials. Plus, tickets can be redeemed for $10 off any La Aroma EE purchase. That practically makes this a Free Event. Tickets are on sale now at our Swift Creek location, 804-249-5000. Tickets on Sale Now for $10, which will be rebated back to you the night of the event! Walt Cukier from Perdomo Cigars will be back in the house from October 21st thru 24th! These are going to be FREE events! Stop in and try the all-new Perdomo Gran Cru utilizing a blend of 100% Cuban Seed tobaccos! Walt will have some fantastic specials on the full range of Perdomo Cigars. Made in Nicaragua, these cigars are a staple in our humidors. From the Milder Lot 23s and Champagnes to the fuller flavored Habano series, there is a Perdomo blend for everyone. Be sure to stop in and treat yourself to deals on some of Nicaragua's finest! Tickets are On Sale now for $10 each. What does the ticket get you? A La Aroma de Cuba Edicion Especial cigar to sample during the event, along with a pairing with Patron Tequila and Dark Chocolate! This unique combination of tastes has to be experienced first hand. Also, boxes of the La Aroma EE will be on sale for 20% off, plus on top of that you will receive a FREE Custom humidor with every box purchase. You can also redeem your ticket for $10 off any La Aroma EE purchase this night, essentially making this auspicious evening a FREE event! La Aroma de Cuba EE is made by cigar superstar Don "Pepin" Garcia in Nicaragua. Call the Midlothian store now at 894-897-7307 or stop in to get your ticket! Tickets are On Sale now for $10 each. Camacho has teamed up with LA Jewelery Designer Matt Booth of Room 101 and together have developed a new blend that is taking the cigar industry by storm. The Room 101 is a special blend of Honduran and Dominican fillers, wrapped in an exclusive Semilla 101 experimental wrapper leaf. If you appreciate a Medium to Full-bodied cigar, you need to give this one a shot. Each ticket holder will get a complimentary cigar at the event as well as access to event Deals and refreshments. Call the Newtown store at 757-229-4060 or stop in to get your ticket now! Jorge Padron, president of Padron Cigars will be on hand at this event to introduce the all new Padron Family Reserve No. 45. Havana Connections will be one of the first shops in the country to receive this all new cigar! The Family Reserve was a blend that was developed exclusively for the Padron Family. A prototype Torpedo vitola was cautiously sampled by Jorge Padron at certain events through the past few years. This all new size is the first time this blend has been commercially available. We will have fantastic deals this night as well. Along with discounts, you may receive a FREE Padron Ashtray and/or a one of a kind Padron Golf Shirt! Tickets are on sale now for $10 in advance or $20 the day of the event. At the door you will receive a Padron 1964 Exclusivo and we will of course have your favorite frosty beverages available. Be sure to get your ticket soon and come meet Jorge Padron himself! CAO Cigars has teamed up with Sucker Punch Sally Motorcycles to produce a custom Lady Liberty Chopper! We have luckily secured 2 of these events, so you have 2 chances to come to our store to check out this bike..its one of a kind! After CAO has finished touring the country with this bike, they are going to give it away! One customer from each event will have their name picked to go into the national drawing for this motorcycle. When you buy a box of CAO Cigars at the event, you will receive 20% off, a CAO 5pack Sampler and a Custom CAO T-shirt. Plus a chance to become a semi-finalist to win the bike. At the end of the night we will pick a First, Second, and Third place winner. First prize is a Max Benjamin Travel Bag/Humidor($300value) and Semi-Finalist for the bike drawing. Second prize is a CAO Champion Sampler and CAO Lighter($140value). Third Prize is a CAO Conmemoravito Sampler and a CAO Ashtray($80value). The deals will start at 12pm, but the real fun will be the special party starting at 6pm. Tickets are $10 each and you must have a ticket to enter. Each ticket holder will receive a CAO America Cigar, beer/beverages and a whole lot of Fun! We will draw the Door Prize winners at the end of the event. San Cristobal Taste of Excellence @ Wesbury. Friday September 11th, 2009 4pm until 8pm. Tickets are on sale now for $10! With each ticket you will receive a complimentary San Cristobal Cigar and a special Tasting Seminar. As you smoke the cigar you will be treated to a special pairing with Johnny Walker Green Label Scotch and Dark Chocolates. And of course there will be Great Deals! 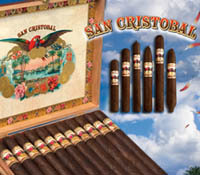 When you buy any Box of San Cristobal you will receive 20% off plus a FREE San Cristobal Humidor by Savoy! Singles will be 10% off! On top of that you can redeem your Ticket for $10 off any San Cristobal purchase this night! That makes this essentially a FREE EVENT! Fans of Full-Flavored Complex cigars will enjoy San Cristobal. It is manufactured by superstar Don "Pepin" Garica. 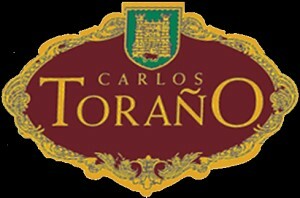 Torano Cigars "Our Roots Run Deep Tour"